Eiichi Tahara reported on the business meeting of the 5th ISGC Board of Directors held at Medical Sciences Teaching Center in Oxford on Monday 1 September 2008. This is on home page of ISGC Newsletter. 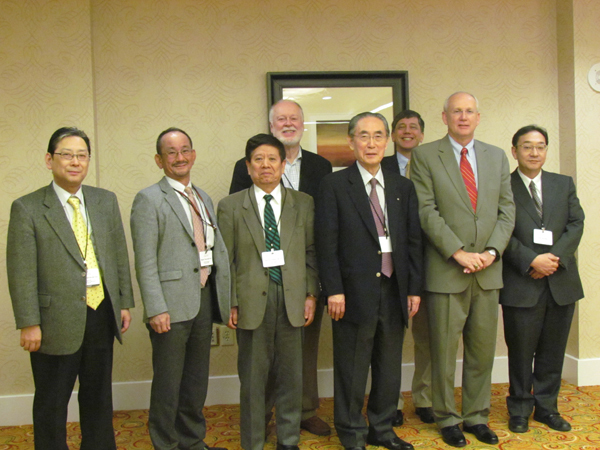 Raymond Dubois reported on the 6th Meeting of ISGC in Houston. An good programme was organized with many outstanding speakers and almost 120 delegates were registered. The speaker dinner was to be held at “Arcodoro” restaurant on the evening of 6th January. Future Meetings: the next meeting will be organized by the new President, Dr. Anil Rustgi, from the University of Pennsylvania, and will be held in October or September 2012. President -Elect: Dr. Yoshihiko Maehara, Chairman of the Japanese Society of Gastroenterological Carcinogenesis (JSGC), and Professor of the Department of Surgery, Kyushu University. has accepted the Society’ invitation to the new President -Elect. Dr. Shirabe, who is a representative of Dr. Maehara, suggested the possibility of joint meeting with JSGC to be held in November 2014. Election of new Members of the Board of Directors: names who were suggested included Dr.Yoshihiko Maehera, Dr. James L. Abbruzzese, Dr.Lee M. Ellis, Dr. Stephen B. Gruber, Dr. Richard Peek, Dr. Brian J. Reid, Dr. Snorri S. Thorgeirsson, Dr. Hang Kwan Yang. Election of new member of the Nominating Committee: Dr. Stephen B. Gruber. Regarding a way of increasing the membership of the ISGC, Dr. Wataru Yasui reported that all of the ISGC Councilors would participate in the membership of the ISGC. Meeting report in Journal：this was discussed on the possibilities of submitting the meeting report in several Journals including Differentiation, Carcinogenesis and J of Gastroenterology. However, it did not reach a conclusion. There being no other business, the meeting was closed at 13.00 pm.